To finish their month of mad march races (they had planned a race every weekend but the snow meant one was cancelled) ERICA GRAYSON and TIM SABAN headed to Richmond Park for a very well organised hilly and slightly muddy 5K race. Tim was first man home in a time of 21 minutes 17 seconds (second place overall) and was awarded a trophy. Erica came home in a time of 27:16. No trophy for her but she was second in her age group, 11th overall and very happy with that. They managed to defy all the odds with a dry race. The Maidenhead Easter 10 has become something of a Good Friday pilgrimage over the years. Spartan PENNY SCHENKEL aimed to average 6 minutes per kilometre and achieved that for her first ten mile race with a finishing time of 1 hour 35 minutes 53 seconds (5.96 minutes per kilometre for 16.09 kilometres). JIM BROWN ran his fastest ten mile race for at least ten years with 1 hour 21 minutes 40 seconds to finish just before the rain started. The popular local club organised event had 1,239 finishers. YUKO GORDON ran the marathon Great Barrow Challenge Marathon, Friday morning in 3 hours 38 minutes 11 seconds. She was second woman. In contrast DAVID BOWKER was on a flat track as he ran the Herts Phoenix open 1500 in 5 minutes 30 seconds. The final day of March saw 19 Fairland Valley Spartans take part in the weekly Parkrun event. Stevenage drew the largest crowd with DANNY SCANLON completing his 80th Parkrun in 19 minutes and 57 seconds and LEE PICKERSGILL his 30th in a time of 24 minutes and 50 seconds. Top 50 finishes were recorded for MARTIN DUDLEY in 22 minutes and 42 seconds, RYAN DUNNING in 23 mins and 58 secs, and BARRY OSBORNE in 24 mins and 24 secs. They were closely followed by STEVEN DOBNER completing the course in 27 mins and 55 secs, MICHAEL O’KEEFE in 28 mins and 21 secs, DAVID SCOTT in 28 mins and 58 secs, LIZ GUEMACHE in 29 mins and 47 secs, ANGIE KEELING in 30 mins and 07 secs, and NIKI PLUMB in 36 mins and 20 secs. In Letchworth VERITY FISHER was the first female home in 25 minutes and 59 seconds, joined by DANIEL SUTTON in the 10th male position in 23:56. Another first female position fell to MADELEINE PRITCHARD at the Beckton event with a time of 23:35. While JOHN ROXBOROUGH’s 60th Parkrun took place on the Panshanger course, which he finished in 21 mins and 49 secs, first time runs at new venues saw JAMES SOUTH complete the Lanhydrock course in 38 mins and 17 secs, and DARRYL STEVENS run the Hogsmoor Inclosure event in 54 mins and 58 secs. 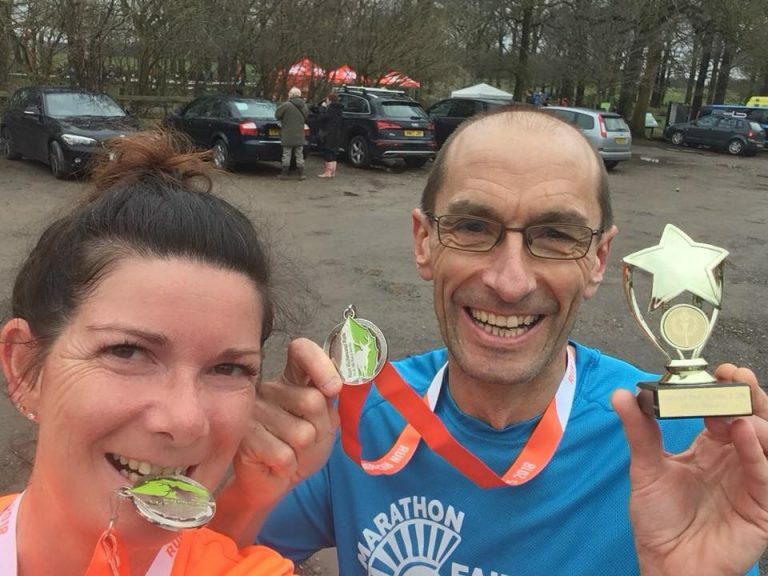 TRACY STILES managed to avoid the mud at Houghton Hall completing the course in 30 mins and 54 secs, and ROGER HARDMAN finished the Newcastle run in 27:53. Many Spartans prepared for Spring marathons by enjoying Fairlands Valley Spartans club training 20 mile run on Friday morning.